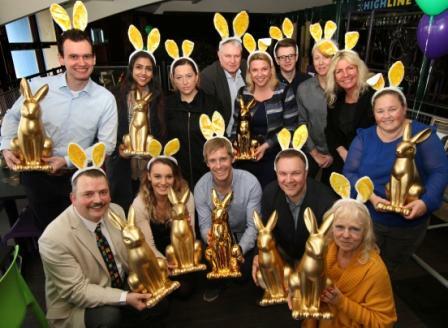 Bournemouth’s coastal businesses have launched a prize filled Golden Easter Bunny competition. Uniting over Easter, the Coastal BID and Bournemouth’s coastal businesses have launched an exciting #LoveBournemouthBunnies competition. A fun and interactive activity, the competition aims to encourage more visitors and local people to explore Bournemouth’s unique coastal strip throughout the Easter period. From now until the 18th April 2017, 10 Golden Bunnies are moving across different businesses within the coastal area. The Golden Bunnies are hopping over to another business every three days, highlighting the wide variety of seaside shops, hotels and restaurants enjoyed by visitors all year round. To take part in the competition shoppers need to locate and take selfies with the Golden Bunnies. By checking into the business where the bunny is found on social media and uploading a ‘selfie’ using the hashtag #LoveBournemouthBunnies, shoppers will win a surprise gift in the hosting business. Everyone who takes a ‘selfie’ will also be entered into a main draw with the chance to win an exciting range of prizes, from afternoon tea, an overnight stay with breakfast for two, to dinner for two and a spa treatment in renowned Bournemouth Hotels. For more information about #LoveBournemouthBunnies competition visit www.lovebournemouthbunnies.info or connect via social media; Facebook (@bournemouthseasons) Twitter (@bmthseasons). To find out more, or to arrange an interview, please contact Darren Northeast of Darren Northeast PR (working on behalf of the Coastal BID) on 01202 676762 or pr@darrennortheast.co.uk.